Cowboys, cowgirls, bullfighters, a rodeo clown, and rodeo queens all made the Wild West Rodeo special for special kids at the Badlands Circuit Finals Rodeo in Minot, ND, on Oct. 5. 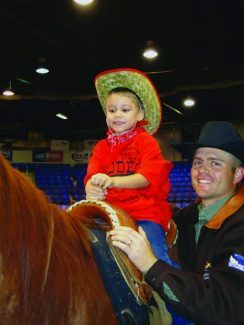 About 35 special needs kids participated in the Wild West Rodeo where they had the chance to take part in modified rodeo events: barrel racing on stick horses, riding a pretend bucking bronc and bull, roping, and riding real horses. Badlands Circuit contestants and finals contract personnel were each paired up with a child. They took the child through each station at the rodeo. Rodeo clown and barrelman J.J. Harrison enjoyed helping with the special needs rodeo. "I love them. I'm a kids guy. It's a powerful thing for me, because it's easy to lose sight of the important things. Kids in general are the future of our sport, of the western lifestyle, of rodeo. Any time you get a chance to give back, that's important."